Sugar Plum Soap Co. 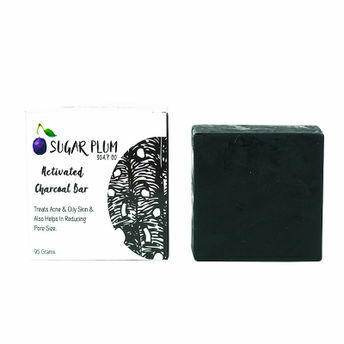 Activated Charcoal Bar combines the aromatic and antiseptic properties of natural essential oils such as tea tree and lavender with activated charcoal for gentle exfoliation. This pure, organic handcrafted soap is perfectly suited for oily skin as it gets rid of excess oil and keeps the skin healthy. Tea tree oil in it helps to treat acne and shrink pores, while lavender oil provides a beautiful light scent to the bar. Activated charcoal makes the skin tighter and firmer and prevents premature ageing. This soap also clears skin blemishes and acne scars. Use it to reduce dandruff and to keep psoriasis at bay.